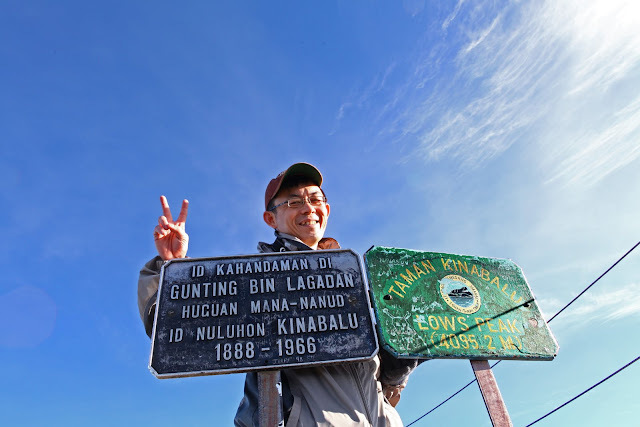 Climbing Mt Kinabalu: Mount Kinabalu Summit: Low's Peak. We made it to the peak. Never seriously doubt that we cannot make it to the top, but still a truly relieving and satisfying experience making to the peak. Looking towards the back of Low's Peak. This is the less captured view of the peak. If we are not careful we will miss these spectacular views. Standing at the peak, most of us were rushing for photographs. With the pressure of other climbers waiting for us to step down, we forgot to look around. We forgot to look at the back of Low's peak. Look at the photo below. Do you know what is the grandeur mountain peak at the background? It is almost as high as where we were standing, Low's peak. Another grandeur view at Low's Peak. My question is: What are these peaks at the background? There are almost as high as Low's Peak. these peaks at the opposite side looks higher than where we stand. Can we climb them? Another direction looking from Low's Peak. People were waiting for us to step down for their moment of photographs. We had to go. Most people think that this is the end of the highlight of the climb. Actually, the show, the REAL SHOW, is just about to start.